The Sound We See: Riga is the title of the audiovisual project that twenty-four active creatives from Latvia (among them: artists, directors, musicians, designers, poets) have been working on in Riga. 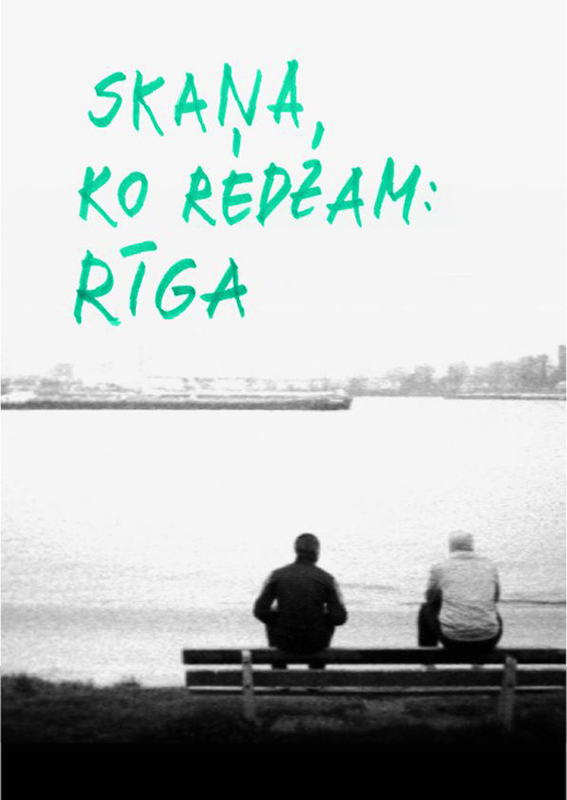 They are cooperatively making a black and white film on today’s Riga in 16mm format; it’s public premier is planned to take place during the opening of the Riga International Film Festival. 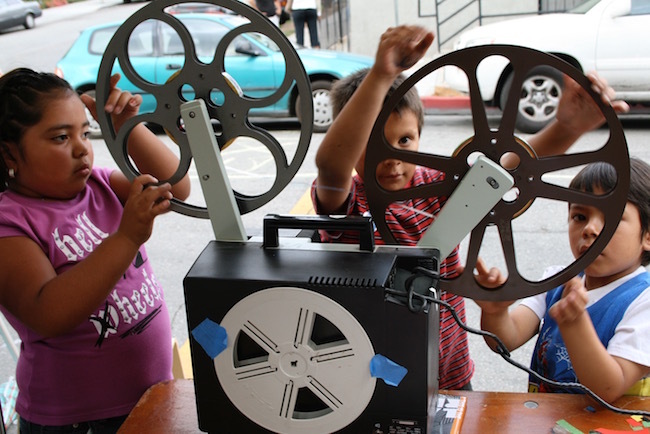 The project is being organized by the culture and art website Arterritory.com, in cooperation with the Los Angeles media art organizaiton Echo Park Film Center headed by Paolo Davanzo and Lisa Marr. Seven years ago they came up with the idea to bring together young people from various walks of life, and in the structure of a master class, to teach them how to use 16mm film technology and to together make a film of their city – Los Angeles – over a period of 24 hours. Since then Marr and Davanzo’s The Sound We See projects have been done in cities such as Rotterdam, London, Hanoi, Berlin, Mexico City, Tokyo and Vancouver, bringing together the most diverse groups of people (the films have been made by children, college students, pensioners, the homeless, artists, Native Americans, etc. ), attesting to the fact than anyone can make a film. Could you please tell us a bit about yourselves – what are your backgrounds and how was the Echo Park Center founded? Paolo: Originally I am from Italy but I grew up in the United States; when I was a kid, we moved to Los Angeles. I started to study Political Science at university as I thought I would change the world through activism and social justice. My parents both were social justice activists. They died in my early twenties (I am now 46). So I opened the Echo Park Film Center to honor their spirit of giving and activism – to help those who had less fortunate lives. 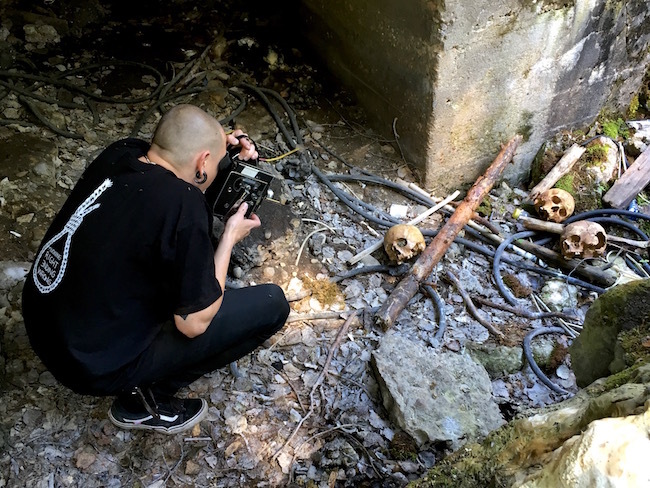 I am an educator, a filmmaker, and an activist, so I decided to combine all those things – activism and education and filmmaking – under one group. Lisa: Originally I am from Vancouver, Canada but I’ve been living in Los Angeles for twenty years. I used to be in a punk-rock band, and my background is more DIY based – writing, painting, photography, and music. I got into filmmaking when I found a Super 8 camera in a charity shop and I wanted to use it. 16 years ago I happened to walk in on the opening day of Echo Park Film Center. There was this guy, he had a beard and big hair, and he said – “You know, we are opening a Film Center today! Welcome!” My life really did change in that moment when I walked in the door. And I loved everything that Film Center stood for! I loved that it was for the people, I loved that we were showing very experimental work – but for everybody in the neighborhood. And there is no another place in Los Angeles that is doing that. I like to say that I fell in love with the Film Center and then I found love with Paolo, because it was the place where I just wanted to be, and I knew that I wanted to spend the rest of my life in this space and with this person, spreading that kind of excitement and joy that I had felt just walking in from the street. Film can change your life! What do you do at the Echo Park Film Center? Paolo: For 16 years we’ve run a cinema, a school, and an artist-in-residency program. The Film Center is located in the traditional working-class neighborhood of Los Angeles called Echo Park. 20 years ago, The New York Times called it the most dangerous neighborhood in America, and last year The New York Times called it the hippest neighborhood in America. There are still a lot of working class people; it is a very diverse and cultural place. We host events every Thursday, Friday and Saturday night, and we show anything except Hollywood feature films. We try to show another way of telling stories – those are human rights documentaries, experimental cinema, art cinema, as well as films in the Spanish language, and gay and lesbian films. And it is community-curated. Lisa: We are probably doing over 200 cinema events a year – films by established filmmakers and also by people who are showing their first films. We definitely have the most diverse program in LA. Not always the best, just the most diverse. We also have a place where you can rent equipment – people get inspired from what they see, so it is important that they have access to equipment, including a lot of analogue stuff, which you cannot find anywhere else in Los Angeles. We have classes for all ages; always free for teenagers or older people over 60, and we give low-cost classes for adults. Every class has a different focus – 16 mm projects, or digital projects, sometimes those are exhibitions. We work with kids from all backgrounds – wealthy kids, poor kids, everybody in between, every ethnicity, every background; we make a place for everyone to come together. Paolo: And we also have artists in residence! Lisa: We are hosting an international residency every summer in the month of August. We give the visiting artist a stipend, an apartment, a bicycle, and they make a work and teach; and we also do two-month residencies for local artists. And now you are doing workshops in Riga. What brought you here? Paolo: Lisa and I are nomadic souls, and for the last twenty years we’ve toured the world. I toured with films; Lisa was touring with her rock-band. So we combined Lisa’s punk-rock music and my filmmaking. That’s a great picture, isn’t it?! Paolo: And we said – let’s keep moving around the world. 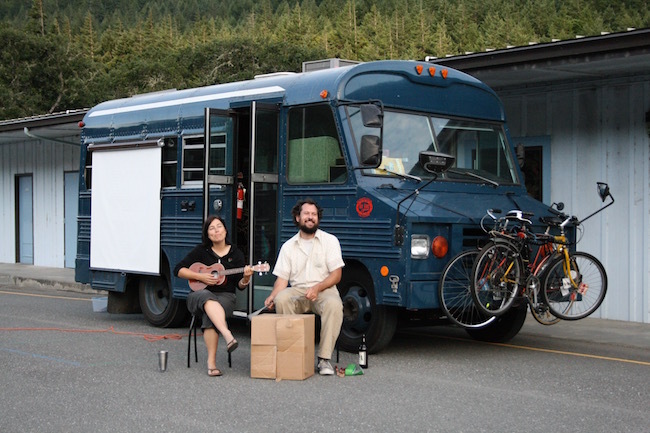 Ten years ago we got a small bus, we put solar panels on the roof, and we drove all over Mexico, the United States and Canada, doing free workshops, playing music. But then we said – let’s take the idea and keep traveling the world. So now we are doing this workshop in Latvia with The Sound We See project. The Sound We See project has been done in several places all over the world. Could you please tell us some more about that? Lisa: The Sound We See project started in the fall of 2010. We came up with this idea that would look at the City Symphony genre and kind of re-imagine it in the 21st century, but still using basically the same technology that filmmakers used almost a hundred years ago. Most people have seen Berlin: Symphony of the Great City, which was made in Berlin in the 1920s. It was the time when film was quite new, and cities were vibrant. Berlin: Symphony of the Great City tends to be very dynamic, very experimental; this was how a day in the life of the city was celebrated, whereas Man with a Movie Camera by Dziga Vertov was celebrating the worker. So we decided we would use this framework for the first class in Los Angeles. We had 37 participants (the youngest was 11 years old), and none of them had shot 16 mm film before. The result was amazing! It was beyond all we could have imagined, and afterwards, talking to the students, they said the process of doing this project completely changed the way they felt about themselves as artists, as citizens. Paolo: The film started to play in festivals all over the world, and it was playing age blind, so it wasn’t that we submitted it to youth festivals. People were blown away by this film, and we were invited to the International Film Festival Rotterdam. There they asked us to come back and teach. So we did guest lectures at the Piet Zwart Institute and also at Willem de Kooning Academy, and we made The Sound We See in Rotterdam with the Filmwerkplaats at a cultural center called WORM. It was still a youth project but in conjunction with art schools – there were art students and kids from the neighborhood. Where does the title of the project The Sound We See come from? Lisa: Because this is based on the City Symphony genre, the idea is that it is like visual music. The images become, in a way, a sound that we see on the screen – it is about the rhythm, and timing, and exploring spaces. Why do you choose analogue techniques? Paolo: I think we love everything about DIY culture – we started our own band, we silkscreened our T-shirts, we made our own zines. You don’t need a huge news publication to validate your experience. Back in days before the Internet, it was all physical. Analogue film is just an extension of that physicality – touching, feeling, and slowing down. We also make videos and take pictures on our phones, we understand that immediacy, but the slowness and the beauty of the analogue is still something that resonates with us. 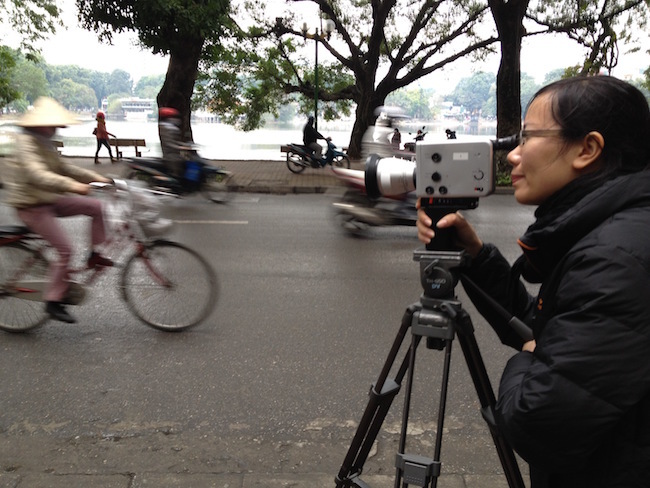 Lisa: I love analogue filmmaking because we can all learn how to do it, and the results are beautiful and magical. And it comes with the DIY spirit that I love so much! Also, this is a good vehicle from the community aspect – to bring people together, involve different backgrounds of all different experiences, to get together – it is like making a soup, like you are doing something and everyone gets their fingers in it and stirs it around, bringing it out and celebrating it – that’s really what we are interested in. Film is a vehicle for that – we love film, but anything that brings people together in this way is magic for us. And the nice thing about the analogue film community is that everyone shares everything. You can go online any hour of day or night, ask someone a question, and they will give you an answer and help you out with this. Anyway, most people will see these films in a visual digital format – on computers, as a digital projection at festivals. That is Ok. We are not purists. Film screenings, workshops, an artist residency program – do you do this just because you like to, or do you feel it is more like a mission? Lisa: I think a little of both. It brings people so much joy to work in this format, and in some ways, people aren’t even aware of it. Most of our students at the Film Center were born after the beginning of the digital era. When people are discovering a different way of working, a different approach, it is like a mind-blower. I love that, and I want as many people as possible to have that feeling before this medium goes away. The film is a tangible, unique thing. There is an inherent magic in working this way – it is like watching a fire when you find yourself drawn to it, and I want everyone to feel that magic. What is like to be in Los Angeles where everything is commercialized – to be there with your completely different kind of project? Do you feel like outsiders? Paolo: We are kind of the opposite of the Hollywood beast. Every day someone walks in and says – Oh, here’s a camera that belonged to my father – he died but please take it; Oh, I have some old movies my grandmother shot in the 50s, do you want them? If we were in a small town in the Midwest, there wouldn’t been the same sort of connection. For us, everyone who walks in is beautiful; everyone is special, everyone is important – that’s the opposite of Los Angeles where everything is about beauty, about fame and fortune and limousines. We are the opposite of that myth of Hollywood. We are the real storytellers. Lisa: And we are the place where people can discover that they are the real storytellers. A large part of what we do is just making a space for the people to realize for themselves that every individual’s story is so much more interesting than anything you see on the Hollywood screen. In the beginning, people don’t believe that! But when they start filming they realize – wow, I have a story to tell! I think that is the legacy of the Echo Park Film Center. Which is the most exciting experience you’ve had with this project up to now? Paolo: Latvians! What will happen here will be the most beautiful thing! Lisa: [Laughs] And that’s true! It sounds silly to say, but the project you are working on is always the best project. And when people make these films they truly believe – and they are right – that their film is the best. Because they made it! And that is the truth! Every group has been amazing, every group has been different, and we have learned different things from each one. For example, Rotterdam kids – they needed to be in front of the camera, whereas for LA kids, that wasn’t important. For India kids – they just love filmmaking as they have seen a lot of Bollywood movies, but they’ve never met something that was outside of that system. For people in Hanoi it was about becoming individuals. When we do these projects, we try to make a community; but in Vietnam, in reaction to the communist system, the whole goal was to grow filmmakers who were very individualistic and who could stand up for what they believe in as an individual. The First Nations community in the Arctic Circle in Canada – it was so humbling to deal with these people! There are only about 250 people in the community. They continue living their life in a traditional way – they hunt, they gather berries. For them it was a way to celebrate their culture. Not just with the visuals but also with the soundtrack. Normally, the soundtrack is ambient music created by a group of musicians. This time the soundtrack was the language. Like many other indigenous communities, they are in danger of losing their language forever. So they took time out of all of this life and death stuff to make this film with us. That’s just amazing! That is really humbling! Anyway, the idea of these projects is not just – we come, we do this, and we leave. 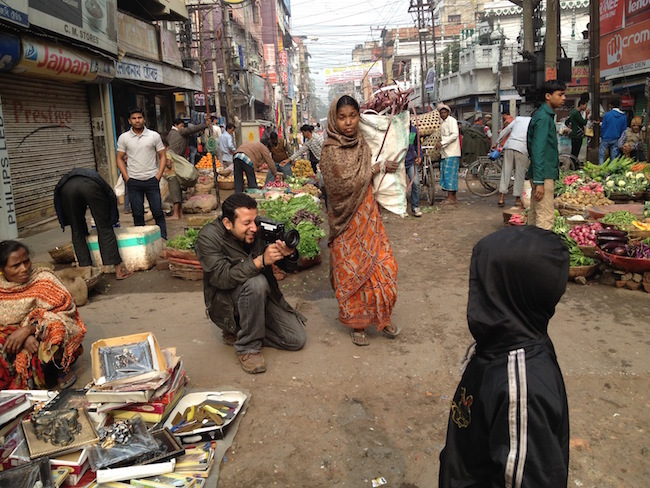 We leave the resources with the community so that they can keep working with film. Here in Riga you have Baltic Analog Lab, so the hope is that some of the participating artists will continue to work in this form if they get excited about it. How do you choose among all these communities? Paolo: Initially, it was just invitations – people were excited about what we were doing. Usually they find us. And we never turn down an invitation – there have been some projects which were very well funded, and there were some projects with zero funding – we did them although we had to contribute our own money. Do you already know where this project will go next? Lisa: There will be one in Spain in a festival next year, then one in Buenos Aires, and in Montevideo...and next spring, Philadelphia as well. Lisa: There are always plans for future workshops. I feel like it is kind of my life’s work; I can do this until the day I die. I love every minute because it is always different even though the framework is the same; the dynamic is different, the working conditions are different, the time of year is different, and cities have their unique personalities. It is endlessly fascinating to me. Is there a place where you definitely want to go and do the project? Lisa: We haven’t been to Africa.